Change the water every 2 days, or when water appears cloudy. Use the provided flower food according to directions. Fill a sink with 3" of tepid water, remove the tubes and cut the stem under water. 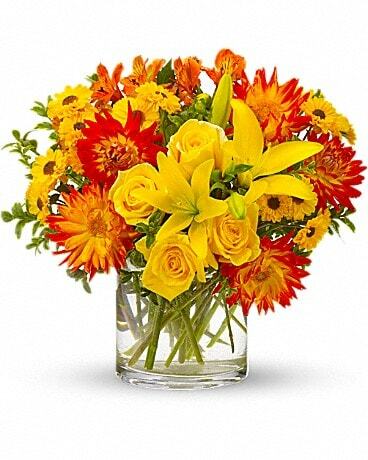 Arrange in a clean vase with fresh, tepid water, following the instructions on the packet of provided flower food. When any flower wilts prematurely, it is a sign that the flower is not getting water up the stem. This happens to very fresh roses, and can easily be fixed. Fill a sink or tub with 3" of tepid water. Cut the stem under water, and lay the rose in the water for approximately 1 hour. The rose will revive beautifully! Location - Hang your basket in an area that receives at least 5 hours of direct sunlight. During the hotter months, it is beneficial to provide shade during the hot afternoon hours. In areas where only part of the pot receives direction sun, the pot should be rotated once a week to ensure even growth and flowering. Watering - It is very important to keep the soil from completely drying out. Plants should be watered thoroughly, so that some water flows from the bottom of the pot. In cooler months, one thorough watering in the month is usually sufficient. During the heat of the summer, two to three waterings a day will be required. Fertilization - Common fertilizers such as Miracle Gro, Peters and Jack's should be applied two or three times a week, using the label recommended rate. In general, 1 teaspoon per gallon, several times a week will provide adequate nutrition. It is very important to allow some water to drain from the pot when watering between feedings. This washes out any excess harmful salts that may build up after repeated fertilization. Plant Care - The plants used in hanging baskets respond very well to pruning. If flowering stops, or have been damaged by drying out, they can be cut back to stimulate new growth and flowers. Simply trim them back to the edge of the pot with scissors or pruning shears. Remember to also cut back the upright growth between the hangers. Give the basket a good feeding, keep watered and in a few weeks, the basket will once again be full and colorful. 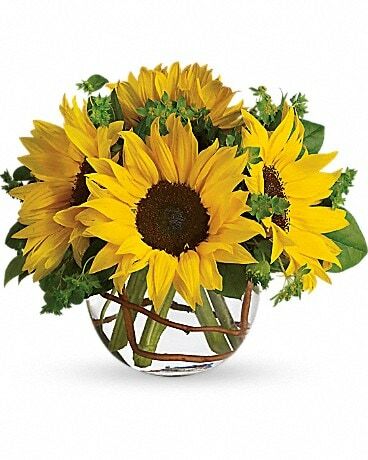 Vase Arrangement - To keep your flowers looking their best, be sure to add fresh water upon arrival and re-cut stems approximately 2-3 days later. Re-cut the stems under water and remember to also replace water, and add preservative (flower food). These measures will ensure you get the maximum enjoyment from your fresh flowers. Container Arrangement - (Basket, Ceramic, etc.) Flowers in these containers are usually arranged in a floral foam - to keep your flowers looking their best, make sure to add water upon arrival. Check the foam on a daily basis to make sure it is moist (if it feels dry to the touch, add water carefully and slowly). Plants - Water when the soil is dry to the touch, but don't over water and don't let plants sit in water as this leads to root rot. Recommended containers have drain holes on the bottom so water will give the plant nourishment it requires without drowning the roots. Fertilize with houseplant food following your florist's directions or the directions provided on the packaging. Most plants require moderate temperatures and medium light, but check specific care and handling tips provided by your florist as ideal conditions vary from plant to plant. Silk and Dried Flowers - To prevent fading, keep these items out of direct sunlight. To keep these items looking their best, dust them occasionally with a small brush and by blowing. If you are going to store them for an extended time, use a plastic bag and place in a crush proof box. Corsages and Bouquets - For optimal display, wear with stems down. Keep in original package in cool place-DO NOT PLACE IN FREEZER. To keep flowers-other than orchids-looking fresh, sprinkle or mist them with water. Fruit Baskets - Although wrapped in beautiful trimmings, please remove the wrappings immediately. Fruit should be stored at room temperature until it is ripe, then refrigerate. Boxed Flowers - If stems are in tubes, carefully remove them. Re-cut stems and place the flowers in a clean container with warm water and floral preservative. Remove any extra greenery from below the waterline to prevent foliage rotting. Replace with fresh water and floral preservatives daily. It is not necessary to completely fill a container, just place enough water in the container for the stems to drink. If a rose should wilt prematurely, remove it from the arrangement. Submerge the flower completely in warm water. Cut the stem near the bottom and leave the whole flower under water for 1 hour. The rose should revive and last as long as if it never wilted. Premature wilting is a sign of a very fresh rose that has not had adequate water. Keep all flowers away from direct sunlight and away from cold drafts. With these tips, your fresh flowers will bring enjoyment for many days.